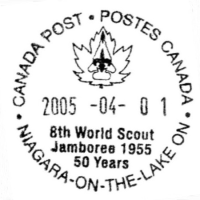 The Scouts On Stamps Society International (SOSSI), Maple Leaf Chapter arranged for some postal souvenirs to commemorate the 50th Anniversary of WJ'55. The club also mounted a display of Scouting stamps at the event. 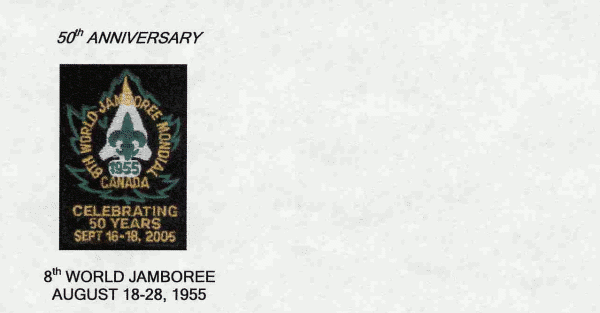 Canada Post produced a commemorative postal cancel for this event. SOSSI created a postal cachet/cover for the WJ'55 50th Anniversary. The September 17 commemorative cancel was used on the cover since this is the main day of the weekend celebration for the 50th Anniversary.